Exit CA 118 at Reseda Blvd and turn right. Travel 200 yards on Rinaldi to Reseda Blvd. Turn right on Reseda and travel 2.8 miles south to Nordhoff Street. Turn left and travel 0.7 miles to Zelzah Ave. Turn left on Zelzah. Proceed through the light to parking lot G4 on the left. Information Booth is located in the lot. Exit CA 118 at Reseda Blvd. Turn right on Reseda and travel 2.8 miles south to Nordhoff Street. Turn left and travel 0.7 miles to Zelzah Ave. Turn left on Zelzah. Proceed through the light to parking lot G4 on the left. Information Booth is located in the lot. Exit US 101 at Reseda Blvd and turn right. Travel 4.3 miles to Nordhoff Street. Turn right and travel 0.7 miles to Zelzah Ave. Turn left on Zelzah. Proceed through the light to parking lot G4 on the left. Information Booth is located in the lot. Exit US 101 at Reseda Blvd and turn left. Travel 4.3 miles to Nordhoff Street. Turn right and travel 0.7 miles to Zelzah Ave. Turn left on Zelzah. Proceed through the light to parking lot G4 on the left. Information Booth is located in the lot. 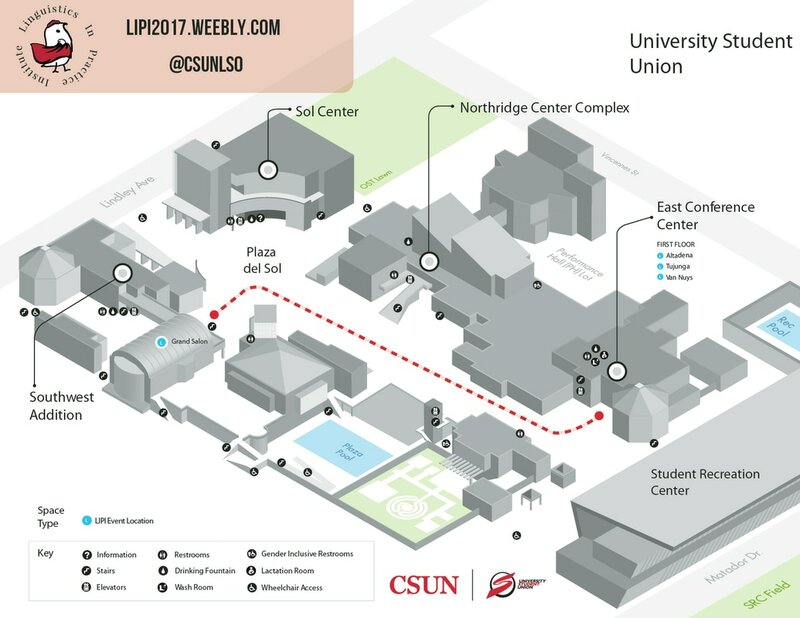 Some free street parking may be available on the outside of the CSUN campus (on Nordhoff Street and Zelzah Avenue) during LIPI. We advise attendees to arrive early if they wish to use this parking option. On campus, parking structure and lot G3, as well as lots G4 and F5 are the most convenient parking areas for the event. Parking permits are required at all times in all areas of campus. All persons using our parking facilities are to park in designated parking areas and spaces and, to purchase the appropriate parking permit before parking in designated areas and spaces. All persons using CSUN parking facilities must park in a marked space within the designated parking area, and must display a valid permit appropriate for the space the vehicle is occupying. Daily Parking Permits are $8, and may be purchased once you arrive on campus from a parking permit dispenser or from one of the Information Booths. Both the parking permit dispensers and Information Booths accept cash and credit cards to purchase your daily parking permit. For your convenience, Visa and MasterCard are now accepted at all locations where daily parking permits are sold. Information Booth #3, located on Prairie Street off Zelzah Avenue, will be accessible to LIPI attendees.